Schoone Oordt Country House is a charming country hotel in Swellendam South Africa, possibly the best of Swellendam accommodation, with 10 luxury bedrooms set in lush gardens, an intimate Conservatory restaurant, a sparkling saltwater pool and a passion for people, family, food, wine and the environment. The emphasis here is on unpretentious, unaffected luxury, elegance, quality and acute attention to detail. Age 7 to 10, 25% of rack room rate including breakfast when sharing with parents. There is a single sofa bed, ideal for children up to 10yrs of age, and space for a cot in each standard & luxury suite. There is space for a cot in the Honeymoon Suite, but no sofa bed. The Family Cottage has 2 extended length single beds in an upstairs loft area with an extended length king for parents. There is a flat rate for this room based on 2 adults and 2 children (of any age). We require a 50% deposit to secure a reservation. No show or early departure forfeits 100% of total stay. Cancellations 0 to 14 days prior forfeit 100% of total stay. Cancellations 15 to 28 days prior forfeit 50% of total stay. Please note that we do consider a cancellation on merit, if it is truly beyond a guest´s control, and will charge accordingly. The 2 Standard Rooms are upstairs overlooking the grounds, accessible from the back entrance and have an inter-leading door via a balcony. There is a single sofa bed, ideal for a child of up to 10yrs of age and space for a cot (pre-booked) in each room. Breakfasts are traditionally a gourmet affair and our little country hotel has developed quite a reputation for them. Complimentary afternoon tea with home-baked savoury and sweet goodies is served overlooking the garden on sunny summer afternoons. In winter, complimentary snack platters and a warming welcome drink are offered on arrival. 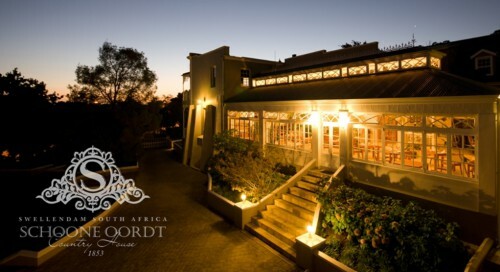 Intimate, delicious dinners are served in The Conservatory Restaurant where guests can enjoy a carefully prepared, sophisticated South African menu with wines sourced (by Sonette) from the celebrated verdant regions surrounding Swellendam; Robertson and Hermanus. Talented Chef Wander is well on his way to building The Conservatory Restaurant into one of the finest of Swellendam Restaurants. Born and raised in the Free State, one of Chef Wander’s first childhood memories was baking in his mom’s kitchen, and at an early age he proclaimed to his family “I am going to bake cakes one day”. School holidays were experimental times and he can remember his dad coming home from work, wanting to know what had been baked, how high the electricity bill was and whether the dishes had been washed properly. He graduated from his mom’s kitchen to the Bloemfontein Hotel School where he obtained his Diploma in Hospitality Management specialising in cooking and then trained in some of the country’s finest kitchens. Chef Wander says that food is one of the most honest and true things in the world, and he strives to keep it so when cooking. His fondest food memories include his first day in cookery class where he experienced the melting magic taste of beef tartare, having only ever been introduced to meat cooked “very well done” whilst growing up… It resembled slightly Remy’s food epiphany at tasting real food for the first time in the Disney movie “Ratatouille”. Another fond food memory is working in the remote Kalahari desert, foraging, cooking and occasionally tasting nxaba’s! (Kalahari truffles) whilst his most recent defining moment was actually meeting, chatting and sharing a beer with renowned chef Richard Carstens of Tokara Restaurant in Stellenbosch. Swellendam is situated on the N2 halfway between Cape Town and George, approximately 220km either way. 1. Take the Swellendam East turn-off. 2. Drive back downhill, through the 3-way stop. 3. Just after the Koornlands River Bridge, turn immediately right. 4. Turn before the grass verge with Swellendam written in white brick on it. 5. Schoone Oordt Country House is on the right. 1. Travel through the tunnel to Worcester. 2. At the 3rd set of taffic lights turn right to Robertson/Ashton. 3. Drive straight through Robertson and Ashton. 4. Just after Ashton is a turn to the right onto the R60 to Swellendam. 5. Turn left at the 4-way stop and continue through the town. 6. Quite soon after the large white church on the left, the road forks, keep to the left. 7. Take the first right into Swellengrebel Street.